“First and foremost, the Vinyl One sounds like music. I never thought of the words “accuracy” or “faithfulness” when listening through the Vinyl One. I just wanted to listen to the music, to hear what the musicians or composers were saying. Pace, rhythm and that ability to make the music move the way the artists intended is part of the Vinyl One’s character — in abundance. You’ll want to get up and dance, play air guitar or do your best Furtwängler impression listening through this piece. The ability to keep the music moving along requires tonal and pitch accuracy, so instruments sound like they’re supposed to sound. 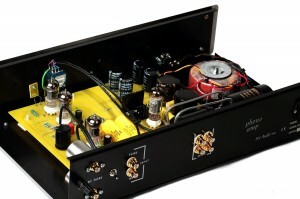 If you like hearing the difference between a rosewood- and mahogany-bodied guitar, this phono stage will do it. As a musician, I like when I hear another musician thoroughly using his instrument and the multitude of sounds it can make. For instance, listen to the wonderful drumming of Tony Williams with the Miles Davis Quintet and the way he uses every part of a single cymbal. On the tune “Dolores” from Miles Smiles, LP #2 in Mosaic’s box set [MQ10-177], Williams is not just getting different sounds from his cymbal, he’s leading the direction the tune is going through those subtle nuances. On that song, he’s leading the band. Through the Vinyl One, it’s obvious”. 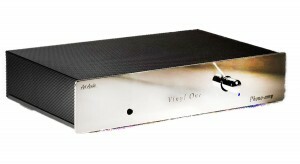 “The Art Audio Vinyl One phono amplifier is an outstanding musical component straight out of the box. If music is a passion that runs deep, if you seek to serve the music in an honest, respectful way, you may find the perfect tool in the Vinyl One. There are more great phono stages available today than ever before (perfect sound forever indeed!). The Vinyl One is among the greatest, and it’s the best I’ve heard”.